Is China building a Fort Knox of its own? 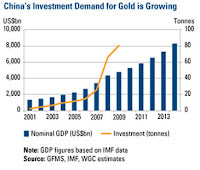 One could be forgiven for thinking so given the heavy emphasis China now has on the acquisition of gold. The biggest buyers these days are not private investors such as hedge funds or the likes of George Soros, but heavy weights such as nations like China India and Russia. In 2010, the central bank of Russia bought a mind boggling two thirds of the nation’s production. India, the grandmother of all gold markets, purchased almost 750 tons, breaking the record of the previous year by a massive 40 percent! Now China, the granddaddy of all gold markets has stated their intention to increase the national gold reserves by, get this, eight hundred and forty nine percent. That is an estimated 10,000 tons of gold, worth around half a trillion U.S. dollars, by the end of the decade. That would be a Chinese Fort Knox if ever there was one. 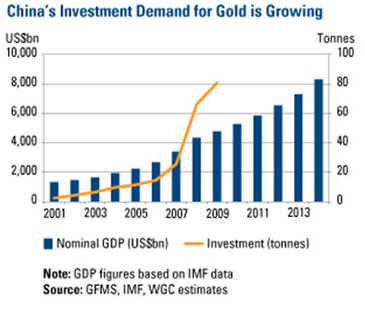 And to substantiate this, in the first two months of 2011 China increased their national holdings by around 200 tons of gold. This trend will almost certainly change the world order as far as government gold holdings are concerned. China will be in a position to start backing their currency with gold and become the first nation, this side of the US dropping the gold standard, to have a gold standard. Although currently the US holds the top spot with 8,133 tone of gold in Fort Knox, if the US Government is to be believed, this will very quickly change if China's does indeed achieve their plan for gold holdings. Meanwhile, back at the ranch, both India and Russia are not sitting on their laurels either but are industriously working over time to assure them a place in the new gold standard world by buying up as much gold as they can get their hands on. 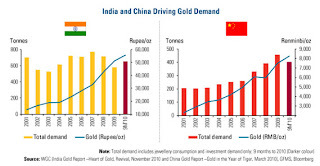 India is achieving a highest ever in gold demand and Russia is following a close second. Perhaps these three heavyweights are learning the lesson the US and Europe have not seemed to grasp. That printing currency to get out of debt simply creates more debt and inflation. Even in Greece, the bankrupt country of Europe, many wealthy are pulling their money out of the bank and buying gold. In Europe, in times of crisis gold has always been considered the ultimate safe haven. The World Gold Council just recently released a new report, which has shown China overtaking India as the largest purchaser of gold in the world. The World Gold Council considers a rise in the disposable income of the Chinese middle class has participated in the rise in demand. Although this could be as a result of economic acceleration due to the reforms taking root in China there is also the added factor that the Chinese government is actively encouraging citizens to buy gold when and wherever they can. In 2005, just 15 million households in China had an annual income of more than $4300 per annum giving them more disposable income to buy gold. In a recent interview on King World News, John Hathaway of the Tocqueville Gold Fund was asked about state owned Citic buying a large stake in Gold One. Hathaway replied, "They (the Chinese) know that they have to have gold, so this is just one manifestation of a strategy to increase exposure to gold by taking a significant position in a public company which conceivably could be used to acquire other mining properties. It’s an incipient foray into the mining equity space which from my point of view as a manager of gold equities, I’m just delighted." "The Chinese have a tiny amount of gold; it's less than 1.6% of their $3 trillion of foreign exchange. They are very open in their public commentary about the fact they don't need as much in the way of FX. That’s going to translate into doing things like we just talked about (mining acquisitions) and they are trying to figure out a way to own more physical gold, there’s no question in my mind about that." When asked if Chinese acquisitions of gold companies would be used to increase China’s gold reserves keeping that gold production out of the free market Hathaway responded, "Yeah definitely, we’re going to read about it after the fact. They are never going to go advertise that they are going to go and buy gold companies or buy physical gold, but I think the next five years you are going to see them being a very important bid in the gold space." "They will have multiple strategies one of which is what we just saw with this acquisition of Gold One. I wouldn’t be surprised to see similar acquisitions by Citic and maybe some other arms of the Chinese state companies." China are also embarking on a strategy of buying up, or at least a significant share, in overseas mining operations to assure them of first pickings on gold and other mineral deposits. This will probably be one of the factors driving up the demand and the gold price over the coming years and with the US and European economies faltering the demand for gold and the gold price is likely going to sky rocket over the coming decade. Chinese Fútè nuò kè sī (Fort Knox), here we come!